Rafting up can be one of the most memorable and enjoyable experiences for boaters. Or not. I always look forward to the weekends when I have the opportunity to raft up with friends. On other occasions, such as major events, rafting up is more a matter of necessity than choice. In either case, it is important that boaters follow proper etiquette and good manners so that no one’s day, or boat, ends up damaged. During football season, many Jacksonville residents take advantage of the opportunity to attend Jaguar games by boat. It is one of the benefits of living in a city where the football stadium is on the water. 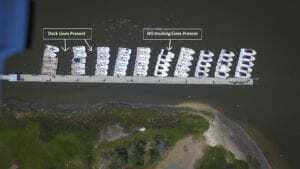 Of course, when you decide to dock at Metro Park Marina, and you are going to the fixed dock, you are going to be required to raft up with other boaters. Slower is better. Slowest is best. Instead of motoring up quickly, move your gearshift forward, then back to neutral, then forward, then back to neutral, so you can bump in slowly. Everyone should know their job. Have one person on the bow and one person on the stern, with line coiled and ready, with fenders out in place. As soon as the person on the boat you’re rafting up to gets your line, the first thing they need to do is put it on a cleat, just around the cleat, so that they can pull in the slack and tighten it down when the boat is in the proper position with the fenders out. You should never raft up to another boat until you have the attention of someone on that boat, if there is one. If the boat you are rafting up to is unoccupied, you’ll need to be doubly prepared. Your crew will have to get lines on the other boat’s cleat to secure your boat. You will also have to make sure that all the fenders are in the proper place. Always use a spring line. Without one, boats can swing forward or back, causing the fenders to get out of place and risking damage. 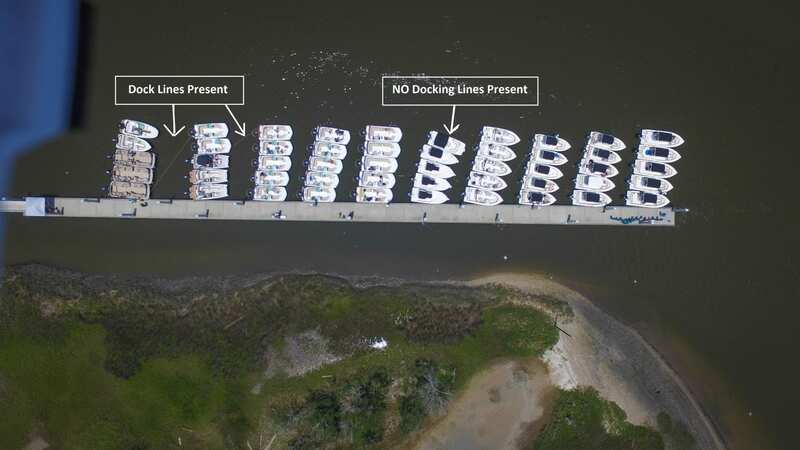 If you are docking at the Jacksonville Landing or Metro Park Marina – and are the third or fifth boat in the raft up — the city dock manager will require you to have an additional line that runs from the bow of your boat to the dock. (I carry two sets of 75-feet of line in case I am the third or the fifth boat in the raft up.) The reason for this: The current runs so quickly on that part of the river that boats rafted out together can swing out of line. You can see from this picture the 6th line of boats is swinging out quite a bit because we did not have that last boat tied properly to the dock. Plan ahead. What if you are the third boat in a five-boat raft up and want to leave? If you have a skilled crew, and people on either side of you to help, you can slip out of the raft up and leave, but it’s not a simple maneuver. You’ll want people who can grab the boats on each side of your boat and move them in once you depart. In such an instance, it is very important to consider the speed and direction of the current and how it will affect your boat, as you leave, and the boats remaining in the raft up.